If you’re looking for a laid-back base where you’ll feel more like an old friend than a guest, these apartments are ideal. 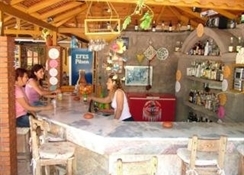 The place is run by a Turkish family who go out of their way to make you feel at home. The setting is a major plus point, too. With popular Icmeler just down the hill, it’ll take you about ten minutes to walk to the centre of town and about fifteen to get to the beach. On the accommodation front, there are just 16 apartments, so even in the height of summer things still feel pretty peaceful. Inside, they’re clean and cosy. The open-plan living area combines a kitchen for rustling up snacks with a comfy lounge. 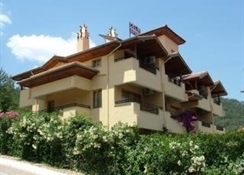 Outside, roomy balconies or terraces offer up fantastic views of pine forests. Another place to enjoy the outlook is the pool. It’s a curvy affair, hemmed by neat lawns and chunky palms. Sunshine-yellow loungers line the water’s edge and there’s a snack bar at one end. For anything more substantial on the food front, just take a walk into Icmeler and take your pick of its bars and restaurants. These calm, family-friendly apartments are located in a natural area, offering views of the forest and towards the town of ?çmeler. 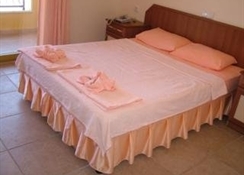 The hotel has 32 rooms and 16 air-conditioned apartments. It is air-conditioned and offers facilities including a lobby, 24-hour reception and check-out services, a hotel safe, currency exchange facilities and a TV lounge. 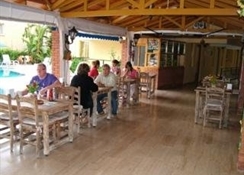 The café, bar and restaurant all offer fine food and drinks. Internet access is also available.The apartments have a private bathroom with a shower/bath and WC, as well as a balcony. Amenities include double or king-size beds, a telephone, hairdryer and safe. The kitchenette has a minibar/fridge, in addition to tea and coffee making facilities. 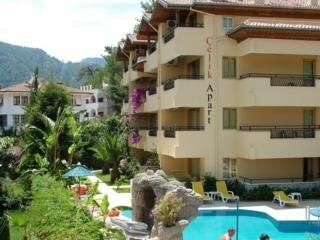 Internet access and individually regulated air conditioning and heating are also provided.